Anyway, you should definitely check out Adrienne Nunez’s post and explore her website, because she totally rules. Now I’ll answer some questions! 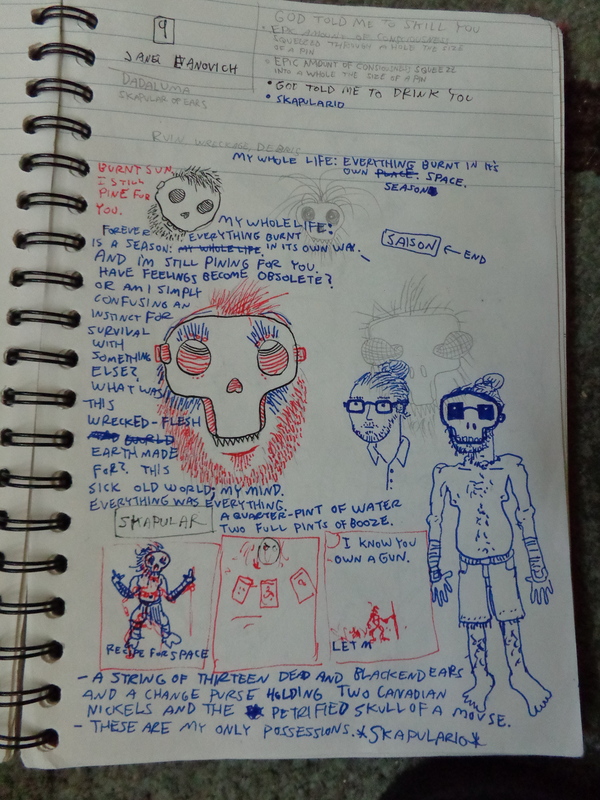 The working pages for my story. 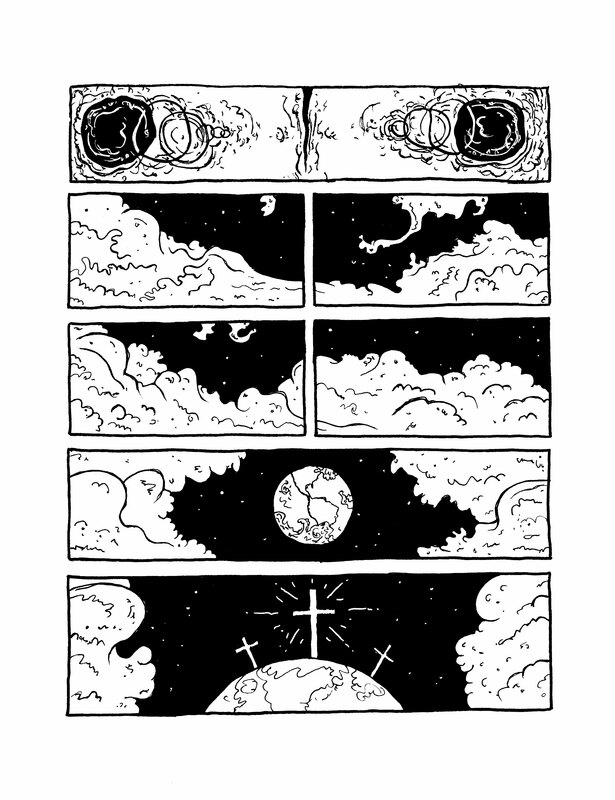 Lately I’ve been working on revamping my comics zine, JETTY. 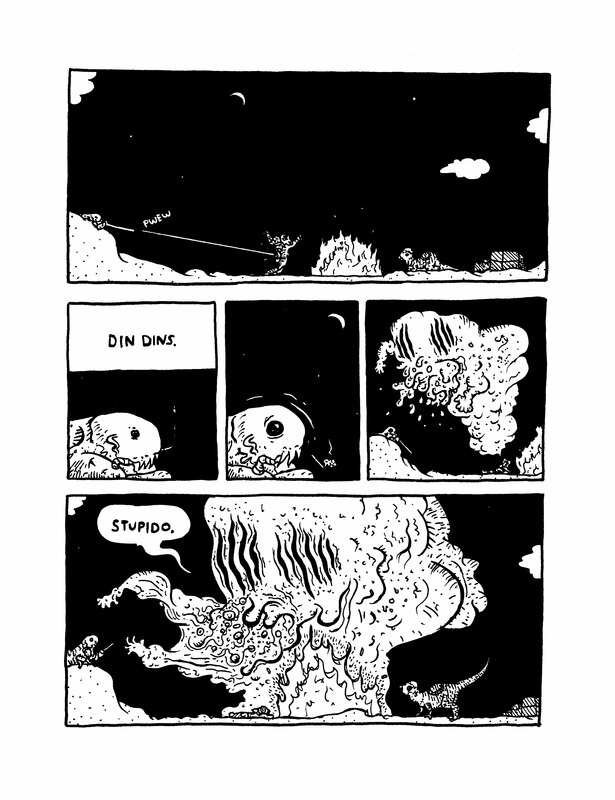 This mostly came about after creating a five page comic (you can read it below as the last item in this blog post) for the Swedish Comics Association‘s upcoming anthology, POSTAPOKALYPS. After finishing the pages, I looked at them and decided I like the general concept and would like to continue to explore it. I’m excited about making some weird tales that take place one billion minutes into the future! I’ve still been working on my more “serious” comic, LOVE, CURRENTLY, but to say the process is moving quickly or smoothly would be a drastic overstatement. On the other side of things, I’ve been sitting on material enough to put together about three new issues of my abstract comics zine, TABE. I just haven’t put any of it together yet. So for the three of you out there who enjoy abstract comics, you can look forward to some new issues coming out sometime in the near future (judging from my current track-record, that could be anytime within the next five years). Additionally, I’ve been working on various painting/drawing projects including a number of larger pieces and some things that are more sculptural. I’ve of course been continuing to lead workshops and classes in the Triangle area and have been enjoying taking time off to spend time with me friends, to meditate, and to read. I’ve been thinking a lot lately about putting together series of posters and/or stickers. This is something I struggle with constantly. What’s the point of it all? Is my work accessible enough? Am I representing life in a genuine and sincere way? I honestly don’t know. What I can say is that I very much enjoy what I do. It’s taken me a while to craft my life into a path where I can work on my various projects and still continue to explore other facets of the human experience. If I couldn’t create, I would be very sad. That being said, there’s always a push/pull going on in my mind. I often compare myself to different artists and authors I admire and wonder what they were thinking when they created. Could be anything. I guess the easy answer to this question is “what else could I do?” The harder answer is something I’m not prepared to come up with right now. 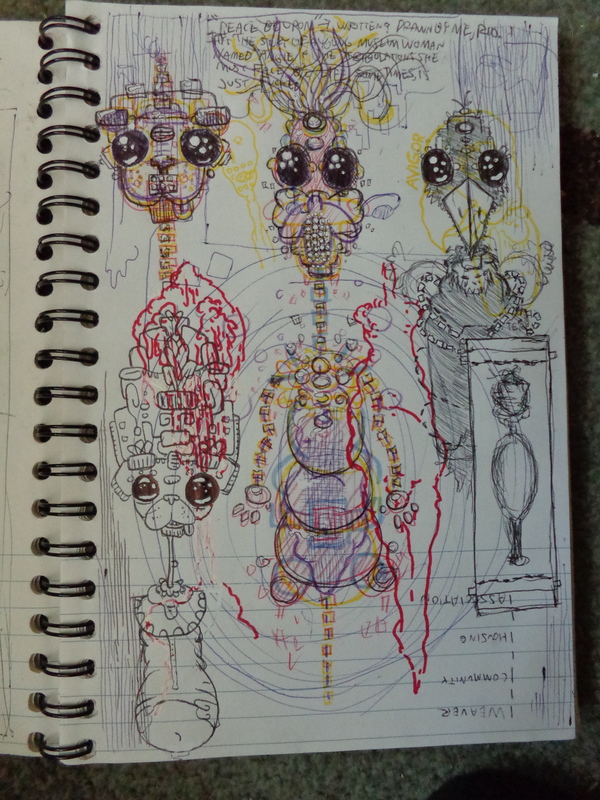 I keep a lot of sketchbooks/notebooks and always have a lot of scrap pieces of paper hanging around. A lot of projects begin in various disparate parts, then I put them together when it feels right. Sometimes it’s like putting together a puzzle; I have to constantly rearrange things until they make sense or become cohesive at least in some way. Other times the parts flow together very easily and I can relax more. Very occasionally I dream something in my sleep and have to jolt myself awake in order to record it before it fades from my memory. I get my best work done in the very early morning, though I’ve been trying lately to force myself into something more of a nine to five routine so that my schedule can more easily coincide with my friends and loved ones. I work every day, but some days more than others. If I’m really in the zone I can work all day and not really realize that much time has passed. Sometimes it feels like the opposite. Like most artists (I think), I find that deadlines can be scary but often facilitate finishing projects in a timely manner. M.R. Trower does some really fantastic and refreshing work. Always smart, with great line quality. Check out their blog and get inspired. 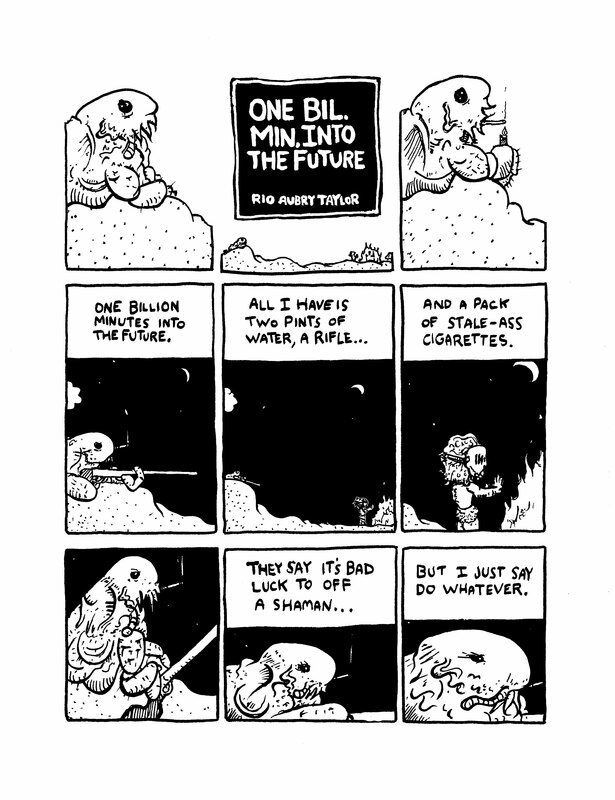 Whit Taylor‘s comics are awesome and insightful (I especially like the Madtown High series). Her narrative voice is distinct and appealing and her blog is full of regular updates on her work and the comics scene in general. ALSO I’d like to give a special shout-out to my friend and fellow artist Brianna Gribben for letting me use her computer. Thanks! 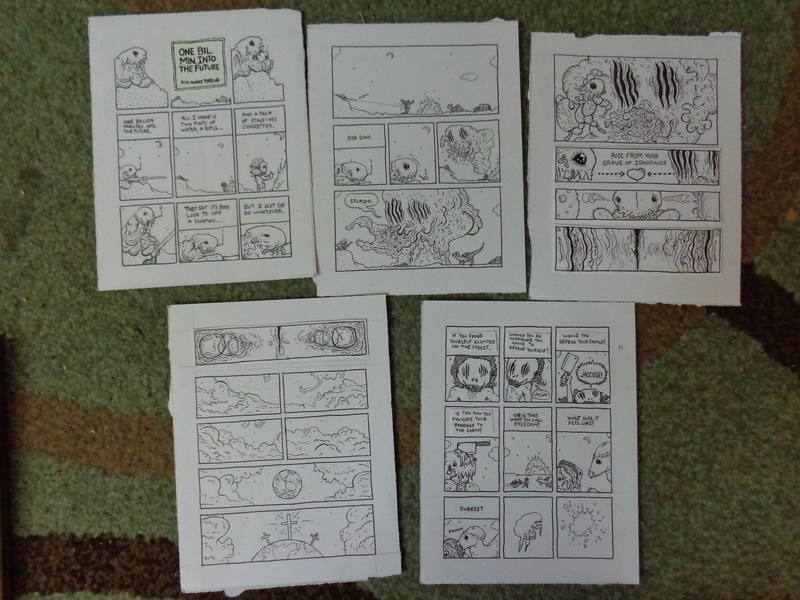 FINALLY (as promised) here are the finished pages I submitted to the POSTAPOKALYPS anthology.Please enjoy and thanks for reading! This entry was posted on September 3, 2014 by Rio Aubry Taylor. It was filed under Comics, Process, Productions and was tagged with Art, Comics, Process, Writing.